N-DReW's Gameplay Improvement is an upcoming mod project that plans to cover the whole game by improving certain features in the game including NPC's, Party Members, Merchant Loot, Custom and Restored Content, Items, dialogue and much more. Future updates may yield content including small side quests! Please be aware this is only a DEMO and is incomplete but it does *plan* to span across the entire game and add new content! 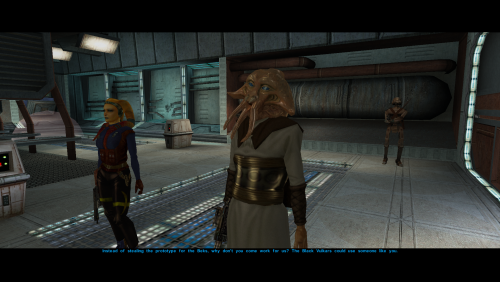 Reworked Nemo's dialogue to be "better"
Improved the Arm with Datapad and Twilek corpse textures. *Some Endar Spire textures in the optional blue reskin may be red still. Will be fixed soon. 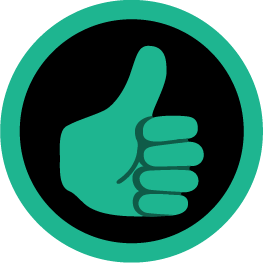 If you have any suggestions for future idea's please give me a PM on Deadlystream and give me a detailed description of what you want and it may be considered (Don't be shy). 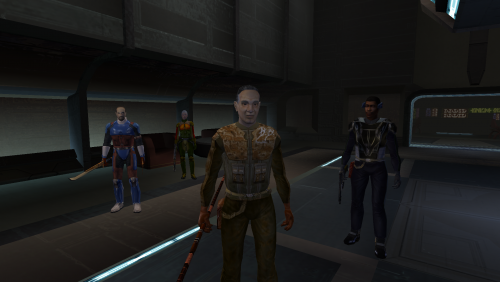 If you would like to help the mod out I will accept whatever help I can especially if you can script or make textures! You can NOT edit, upload to other websites or claim as your own without permission from me. 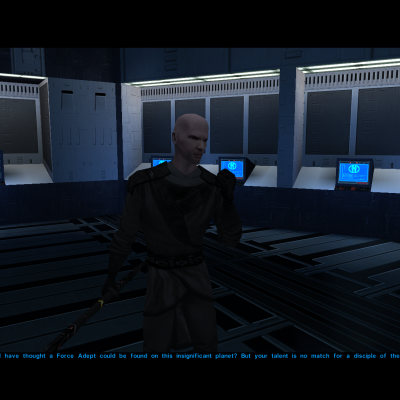 In the changelog, you specified that you made it possible to acquire 2 Sith uniforms on Taris. 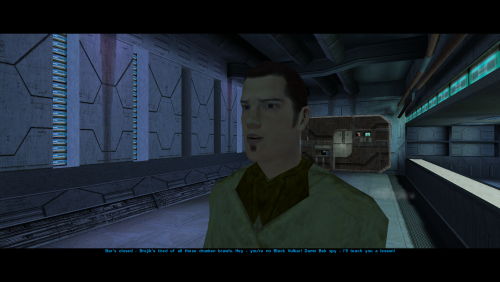 And that you added the Republic uniform as a unique entity rather than overriding the clothing. 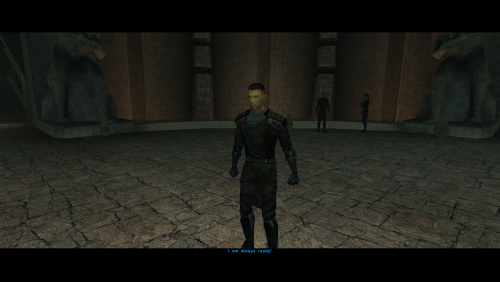 Though I may have misunderstood that to mean the armor worn by vanilla Trask. 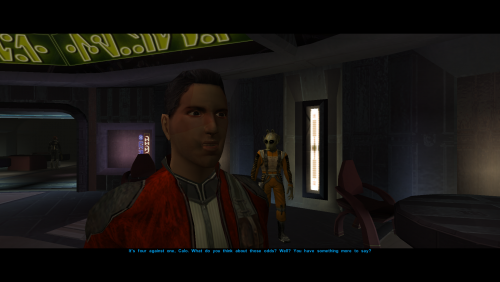 The "Republic Uniform" is the vanilla clothing reskinned to look like Republic Uniform. Try what I suggest and you'll see what I've done with them. As for the Sith Uniform, it isn't like in K1R YET. 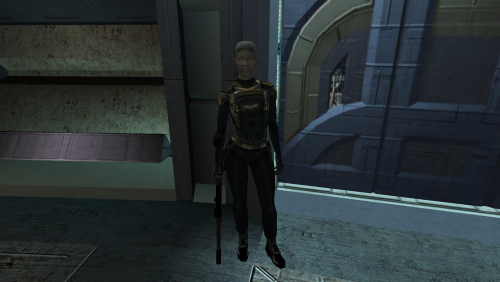 All I've done is give a second Sith Soldier in the apartment to drop the second set of uniform which is entirely cosmetic right now. I see. Do you think that, when it is complete, you might consider releasing it as a standalone option? I really want that feature, but I have way too many mods that conflict with this one to install the whole thing. I played this mod early on in it's design and liked your ideas, I'm looking forward to further additions you implement! 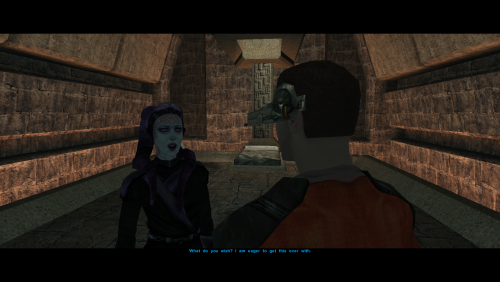 I'm interested in your take on the Saul Karath Leviathan battle and the Sith Master on Manaan. 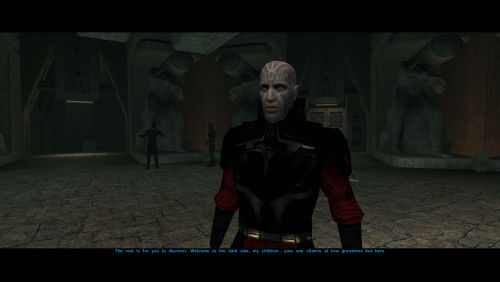 Have you made Calo Nord / Darth Bandon's encounters tougher? Potentially, should no one beat me too it. I'll have to study how K1R accomplished there's though. 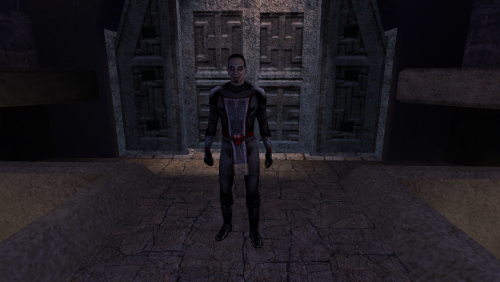 Probably an NPC and a balancing Overhaul, more detailed ideas may come to light soon. 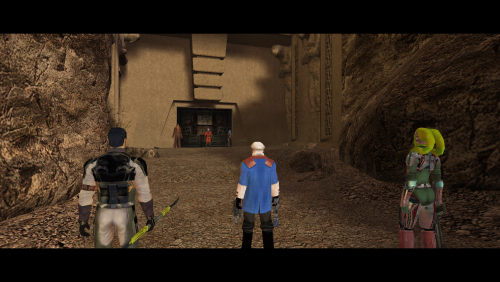 Most likely, I have changed Calo's equipment and Bandon is a WIP right now. For both Calo and Bandon, their stats shall be the exact same across all planets meaning one planet won't be easier or harder depending on which planet you pick. 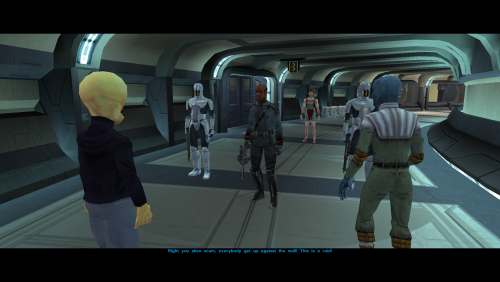 Got a suggestion if you haven't done this already: Make the Echani Mercenaries on Manaan look like actual Echani and restore the Echani mercenary in the Manaan cantina. I've technically already done just that except it isn't released yet. 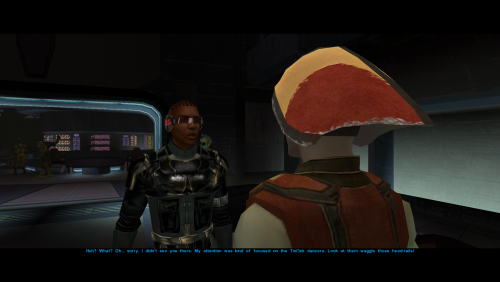 I've restored the Echani Merc dialogue but adding his dialogue to the "I am not for hire" Echani. Good! 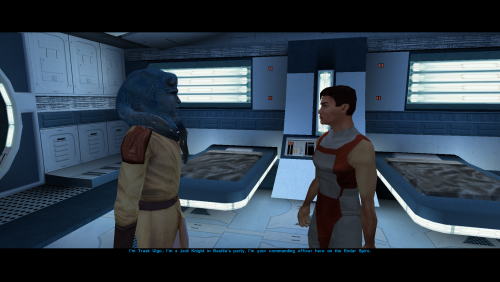 Also, three more suggestions: Ice's(the Taris duelist) armor doesn't look very good and neither does Marl's. I would suggest using the Krath or Echani armor for Ice. Next, Jolee's wife Elora should look older like in Kainzorus Prime's NPC overhaul mod. 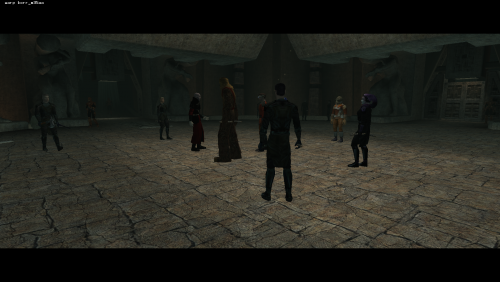 Lasty, I hope the Outcast Children in the Taris Undercity are restored in this mod. At some point, I may go over the Upper City Cantina again. *Sunry's* wife Elora will definitely look older like in KP's NPC Overhaul mod and the Outcast Children have already been restored in 1.17.0, despite that, I will probably still need to go over the Undercity to improve it further. 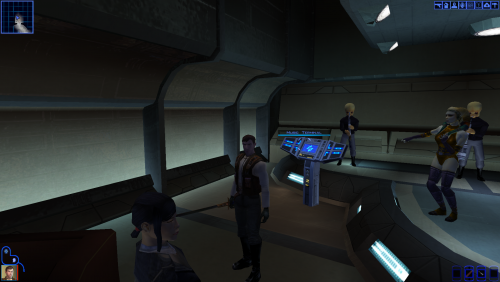 ﻿﻿﻿﻿﻿﻿ At some point, I may go over the Upper City Cantina again. *Sunry's* wife Elora will definitely look older like in KP's NPC Overhaul mod and the Outcast Children have already been restored in 1.17.0, despite that, I will probably still need to go over the Undercity to improve it further. LOL! Sorry! Wrong person! I accidentally said "Jolee's wife" instead of "Sunry's" wife! Wrong character! And why so much effort in the Undercity? Going to test this mod now with several other cosmetic mods. If I run into anything gamebreaking, I'll let you know. -I was unable to select any blaster feats(Sniper Shot, Rapid Shots, or Power Shot) on my character starting out. Might be caused by another mod. 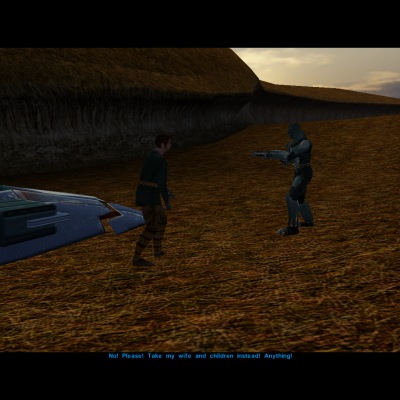 -Gana Lavim's thugs do not ambush me after I leave the cantina after insulting her. 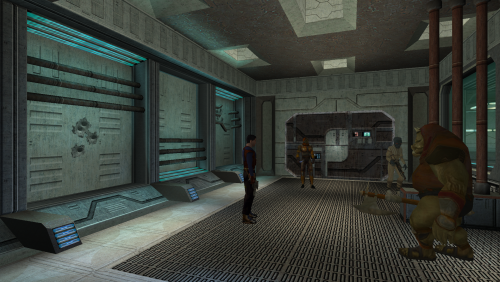 -The prototype vibroblade and other items do not drop from NPCs on the Endar Spire. 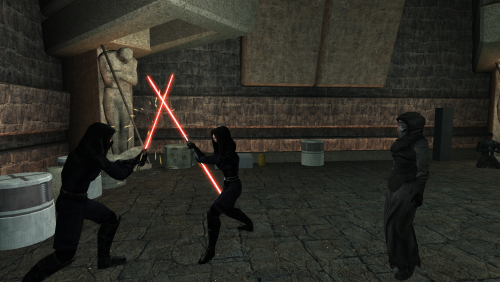 -Will this mod work with JC's Jedi Robes mod? The Jedi on the Endar Spire that fights the Dark Jedi wears robes in that shape, put the texture was not applied properly. -Several Music tracs in the Upper City Cantina are not implemented. 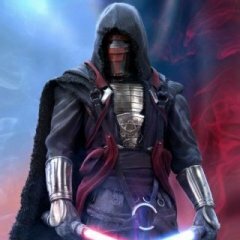 -Wearing Repbulic Commando armor on a Sith controlled planet(ESPECIALLY since there's a Republic logo on it) is pretty stupid....and so are the Sith Soldiers who fail to recognize Bastila. -Ice(since she's an Echani here) would look GREAT in Echani armor. 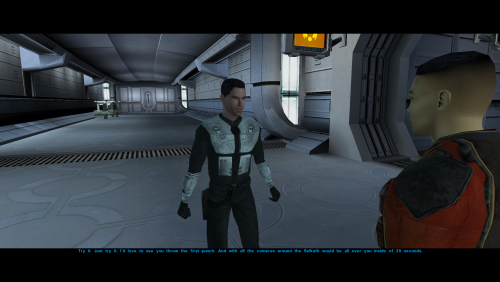 -Also, why is Bendak Starkiller an Iridonian instead of a Mandalorian? 1) Those are intentional. In K1GI instead of levelling up to get Blaster attacks, you get them from weapons. 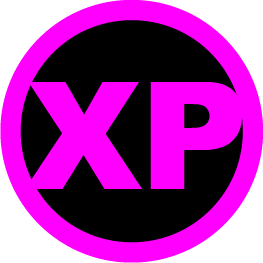 For example, Canderous' heavy repeater gets Master Rapid Shot and anyone who wields Canderous' heavy repeater will get Master Rapid Shot. Generic weapons like normal Blasters won't get any special attacks. 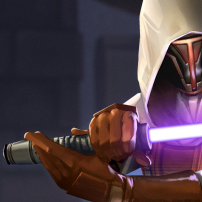 Same goes for Sneak Attack, scoundrels no longer get them and only wearing a certain mask will give you the sneak attack feat. To balance this out, class-exclusive feats like Uncanny Dodge can be gotten by other classes but only scouts will get them automatically (Scouts get uncanny dodge, Scoundrels get Scoundrels Luck and Soldiers get toughness all for free). 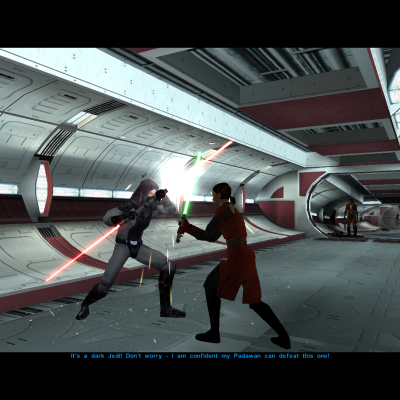 While it is untested, you should be (or in the future) be able to get exclusive Jedi feats like Force Jump with different classes. Also, "Simple Weapons Proficiency" has been restored and Blasters have been made slightly stronger than melee weapons unlike in vanilla. 2) That could, in fact, be a bug! 3) The mod also has gone through major loot changes as well. Chances are vanilla loot has been removed and new modded loot has been added. 6) Did you copy all the .mp3 and .wav files into your "Streammusic" folder? 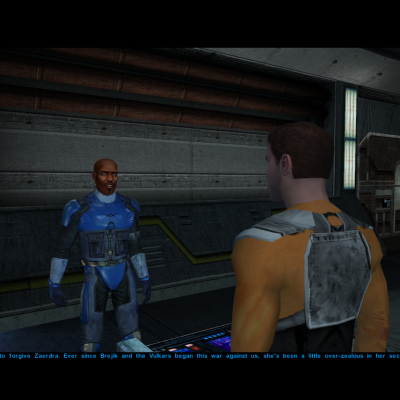 9) The dialogue did not specify that he was a Mandalorian so that is a placeholder for what I may be able to do in the future, I might still have him be a Mandalorian though. Thank you for clearing all this up! I don't really agree with the blaster attacks being weapon exclusive, but you do what you want. It's your mod. 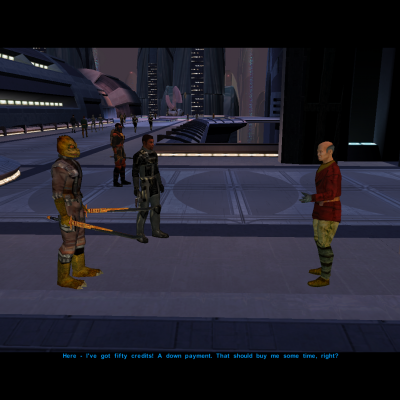 Oh and here's another robe mod that I like: https://www.gamefront.com/games/knights-of-the-old-republic/file/jedi-robe-reskins-council-style. Kind of wish you could use it with what you have here. That or JC's robe mod. 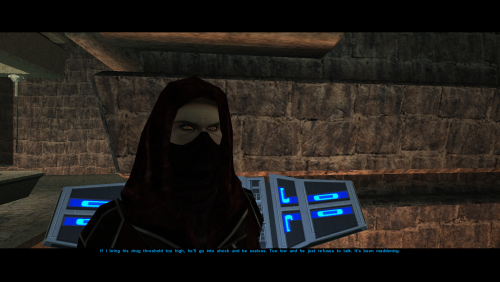 Oh and I don't like the vanilla masks in KOTOR so I downloaded a mod to make them invisible. 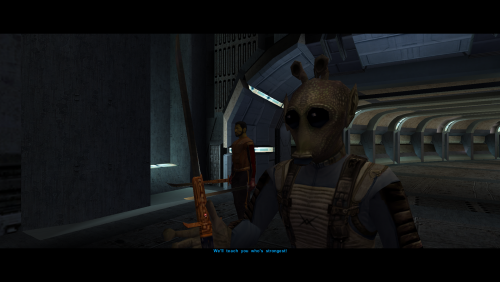 Could you do that in your own mod? Also, I love how you're integrating SpaceAlex's unfinished project into your own! It's good to see all that work isn't going to waste. Furthermore, check out Ebmar's 'Legends' series. I've downloaded most of those. It's great! Two, JCarter has made some great cosmetic mods, too. I'd like for their stuff to be compatible. The Powered Battle Armor and Powered Light Battle armor are eye-sores and should be re-textuered. Marl does not look in Powered Battle Armor. You could give him his own unique set like SpaceAlex did or just equip him with different armor. 1. A completely cosmetic version. No alterations to anything but appearances. 2. 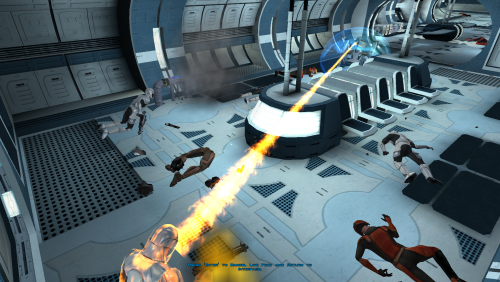 A version with only the altered gameplay. This way, people could customize the look of their game but have your gameplay alterations. 3. The full package. Everything included. Overall, keep up the good work and may the Force be with you! I agree with the above comment, it's a thing that SpaceAlex's mod missed out on. As the altered gameplay caused all the bugs whereas the appearance changes / stat changes didn't. Also the gameplay changes are usually more subjective. I agree with the above comment, it's a thing that SpaceAlex's mod missed out on. As the altered gameplay caused all the bugs whereas the appearance changes / stat changes didn't. ﻿Also the gameplay changes are usually more subjective. As for the two alternate downloads with simply the visual changes and the gameplay changes being separate that will have to wait until the full mod is released so that I know exactly what is final and what isn't. Do keep in mind, this is a Demo and bugs are to be expected but if you do find a bug I will happily fix it should it be reported. 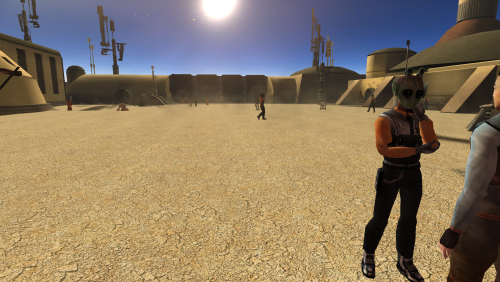 As for the picture, at some point, I will go back around to Tatooine and fix them up by adding more variants of miners for Anchorhead. 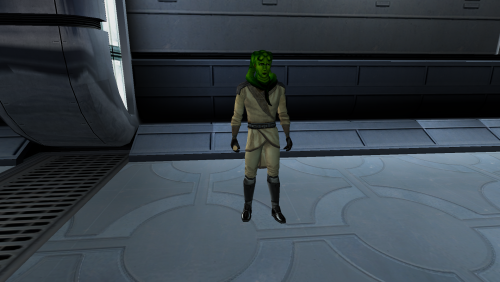 The Rodian head goes with everything lol, it looks great with the Czerka uniform! 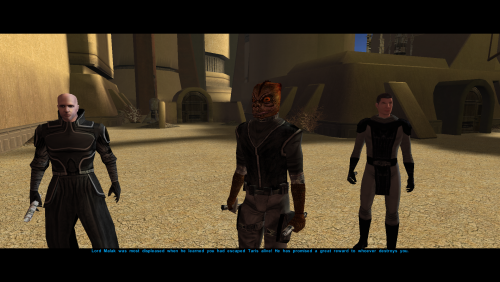 Yep, which obviously means more aliens that usually can't wear armour will be added to wear armour just like the Rodian. 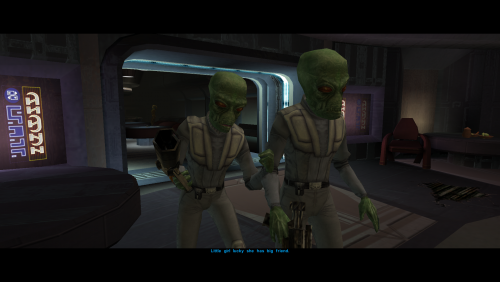 Only issue I have with the Rodians in armor is that the hands aren't Rodian hands. They're human-like hands. But this is really minor issue, though. That's easy enough to remedy. 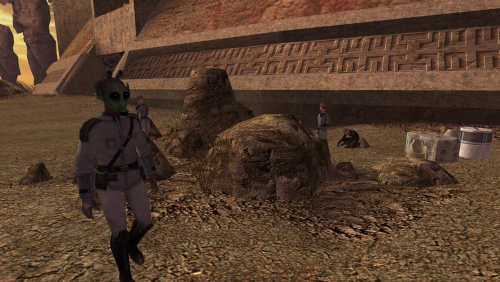 I already have some TOR-ported Rodian hands rigged up from the alien Jedi experiments I was doing. I should probably release them as a modder's resource at some point.